Workplace diversity is on the rise, at the expense of the traditional corporate office – in some countries more than others. Some employees no longer see a corporate office at all – those working in a corporate office at least once a week fell from 100% in 2010 to 89% in 2012, according to Forrester’s 2012 Workforce Employee Survey. Employees working at home at least once a week rose from 18% in 2010 to 27% in 2012, while those working in a public site reached 12% in 2012, up from 5% in 2010. While some employees still use the corporate office, fewer do so full time. In the US, full-time corporate office use fell from 80% in 2010 to 72% in 2012. 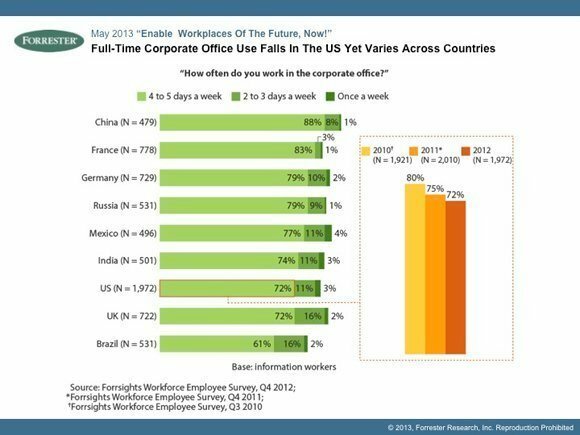 The corporate office is even more out of favour in Brazil, with only 61% going in four to five times a week in 2012, compared with 72% in the UK and 83% in France, where the corporate office still maintains a tenacious hold on employees (see Figure 1). Both supply-side and demand-side forces drive workplace diversity. In this era of austerity and cost-cutting, corporate leaders look to optimise space and ultimately reduce their real estate assets. Why? Because at some point costs become fixed and cannot be cut further. Once you don't have the space, you can get rid of the lease – and the energy and maintenance costs. New accounting regulations and political pressures increase incentives to reduce real estate footprints – and company executives are paying attention. What about the demand side? What do employees want and need from their workplace? The challenge here is that requirements are changing with the evolution of the workforce. Retiring baby boomers will leave the workplace at a steady pace, making room for younger employees who work differently. Next-generation employees embrace workplace diversity, and require greater connectivity – many taking matters into their own hands by choosing (and buying) their own work tools and their places of work. While younger employees do go into the office more than their more senior counterparts, they are also more likely to spend a day a week at home, a client site, a public site, or travelling – 15% of younger employees aged between 18 and 24 work from a public site at least once a week, compared with only 5% of their older colleagues. When asked how they would prefer to contact a colleague on a different floor in their building, younger employees were four times more likely to send an instant message and five times more likely to launch a video chat than their older colleagues. Employees, younger ones in particular, are taking matters into their own hands. Some 32% of employees report buying something work-related with their own money, with 22% having purchased their own smartphone and 11% their own tablet. Renegade software use is also prevalent, with 21% of employees having installed unsupported work-related software. That trend is greater among younger employees, with 25% of 18-24-year-olds buying their own software, compared with only 12% of those above 55. Where to work is also part of that equation. Two trends reinforce workplace diversity: the mainstream acceptance of teleworking; and the rise in coworking, the newest kid on the workplace block. Despite the recent hullabaloo around Yahoo's about-face on its work-from-home policy, most organisations recognise the need for flexible work policies. At JetBlue Airways, 6,000 of the airline's 8,000 reservation agents work from their homes in the Salt Lake City area. Even the US federal government passed the Telework Enhancement Act of 2010, which required all federal agencies to establish teleworking policies and procedures for all employees. Coworking spaces, often referred to as a "third place", provide an alternative work environment to the corporate office and to home. They provide desks, conference rooms and all the trappings of a corporate office, combined with a social community spirit found in a café (as well as the coffee). Deskmag, a publication dedicated to coworking, estimates that there are 2,072 cowork spaces globally. The Hub, a franchise of cowork spaces, has more than 30 member spaces across five continents, with another 50 in the process of joining. Although most coworkers are freelancers and entrepreneurs, company employees make up about 15% of their numbers. Many companies now encourage employees to use cowork spaces. In a recent Deskmag survey, the number two reason people use a specific space was because their companies paid for it. Buildings must be smart. That's table stakes for efficient operations. And optimisation of office space will drive workplace design choices in terms of space, layout and technology tools. But controlling costs through real estate consolidation will remain the priority. Cost pressure will drive enterprises to embrace on-demand real estate strategies. CIOs must guide decisions on the appropriate tools and integration with existing space management applications. On-demand real estate strategies lead to a more distributed workforce and require new management strategies. Organisations must ensure they are appropriately setting the goals, monitoring the performance and assessing the results of the extended workforce – at all levels. A strategic CIO will guide human resources (HR) in selecting the appropriate tools to manage the change and the new way of working and sourcing talent. Global corporations must recognise the differences in workplace diversity among their regional subsidiaries. Those with offices in Brazil must recognise that the corporate office holds less of a draw for employees than elsewhere and accommodate the requirements of local employees. With workplace diversity increasing, the lessons learned from Brazil can inform workplace strategies in other regions. 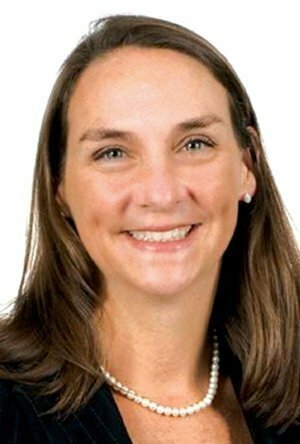 Jennifer Belissent (pictured) is a principal analyst at Forrester Research serving CIOs. She will one of the keynote presenters at Forrester’s European Business Technology Forums (CIO, EA, SR, IO, SVM) in London on 10-11 June 2013.